When young Dorothy landed in Oz she wasn't alone, she had her best friend Toto with her. It was up to these two to make their way down the yellow brick road to the Emerald City to ask the Wizard for a trip back home. Toto is one of the most lovable yet one of the most underappreciated members of the Yellow Brick Road crew. But let’s face it, Dorothy would not be who she is without her little dog Toto. After all, the Wicked Witch even wanted to take him out - he must be pretty important! Now you can have Toto join you on a Halloween adventure with this great basket and stuffed dog accessory. It’s the perfect complement to any Dorothy costume and is fun detail that will set your costume apart from everyone else’s. Team up with the rest of the Wizard of Oz characters for a fun night out this Halloween or for a complete look for your next play or theme party. 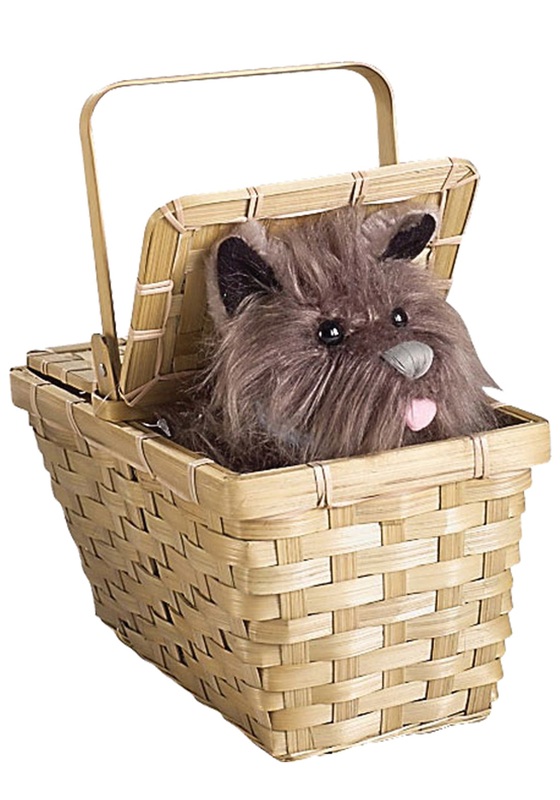 The wicker basket measures 11.5” tall and the stuffed dog fits perfectly into the basket and can have his head out for the trip through Oz to the Emerald City!